Disclosure: This post was sponsored by Honey Bunches of Oats Chocolate as part of an Influencer Activation for Influence Central. I received complimentary products to facilitate my review. Most people think of cereal as breakfast food, but my family enjoys it almost nightly for dessert. 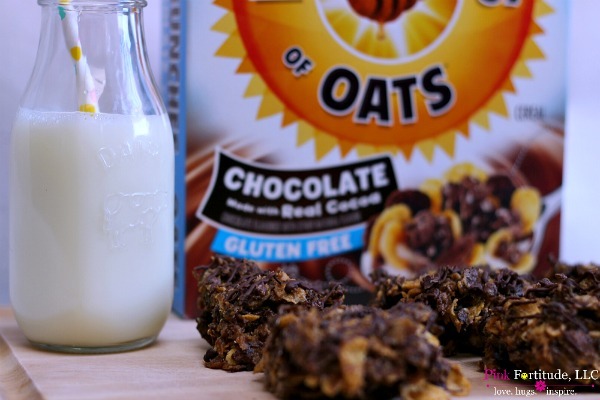 When I learned that Honey Bunches of Oats has a new gluten free chocolate cereal, I was excited to mix it up and make some chocolate chip cereal bars for the boys to enjoy. 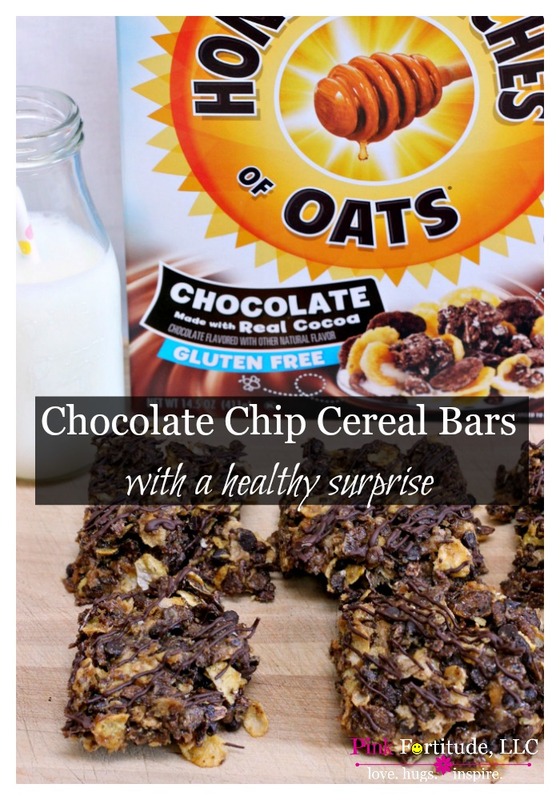 But rather than use a traditional cereal bar recipe, I opted for a healthier surprise. I’ll start with the Spoiler Alert – the healthy surprise – MEDJOOL DATES! They are my new obsession. Put them through the food processor for a few minutes, and they taste just like caramel. 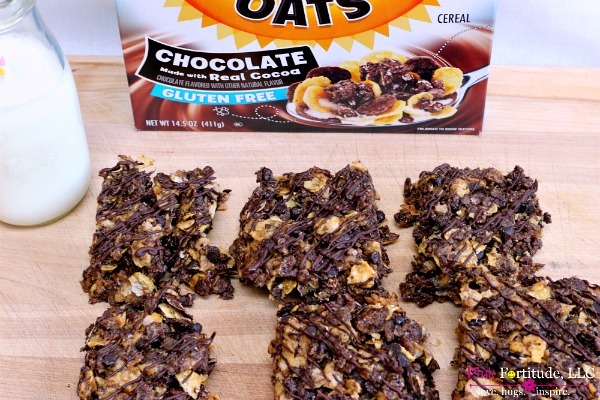 Many cereal bar recipes use peanut butter or even marshmallow as the “glue” to hold everything together. Medjool dates have the same sticky consistency but are much healthier for you. I used around 20 ounces of pitted dates in the food processor. You may need to work in batches, and feel free to add one tsp of water every so often to loosen them up into the creamy paste consistency you are going for. You will need to stop every so often and scrape down the sides. It may take several minutes and just be patient. This is the most time consuming part of the recipe. 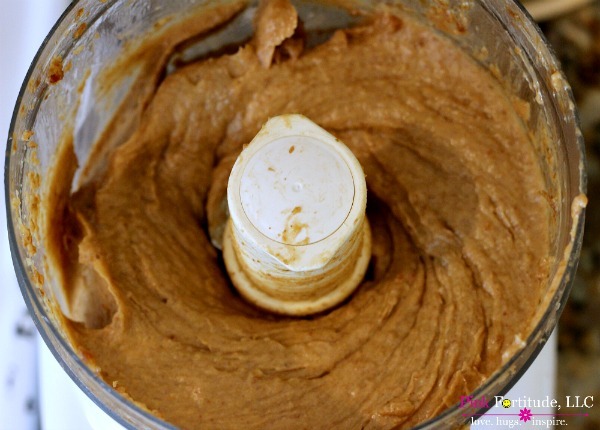 You know you have reached the correct consistency when it’s similar to peanut butter. After you make the date paste, it’s smooth sailing from there. Line a 9×13 pan with parchment paper. 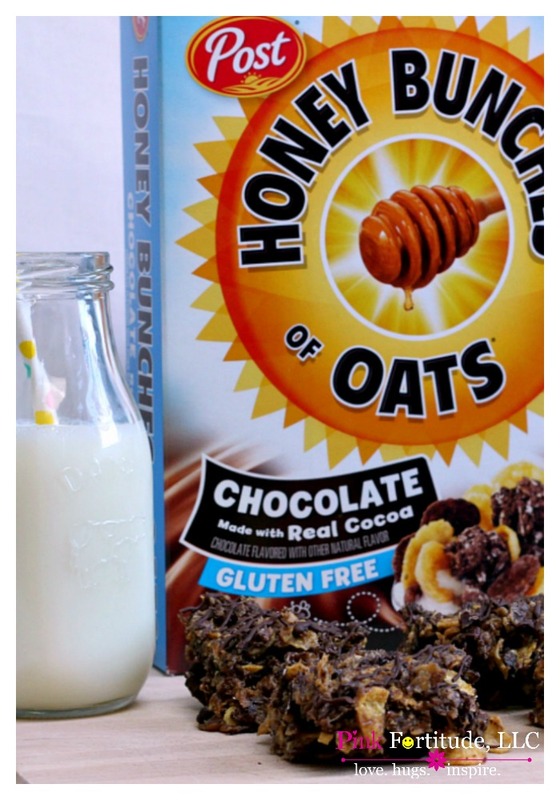 In a large bowl, mix the date paste, one box of Honey Bunches of Oats Chocolate, and 1/2 cup of carob chips (or chocolate chips). The date paste is going to be very thick, so you will want to add it in a little at a time, and gently mix it together with the cereal, as not to break the cereal. I recommend using a spatula or wooden spoon. Place into the pan and spread out. The secret to the cereal bars sticking together – press down firm and gently with a spatula on top of the cereal mix. You can also place parchment paper on top and roll a can of soup over top to flatten them down even more. Just be careful not to use too much pressure as you don’t want to crush the cereal. Because I’m just a little bit of a chocoholic, I always like to melt some chocolate and drizzle it on top. 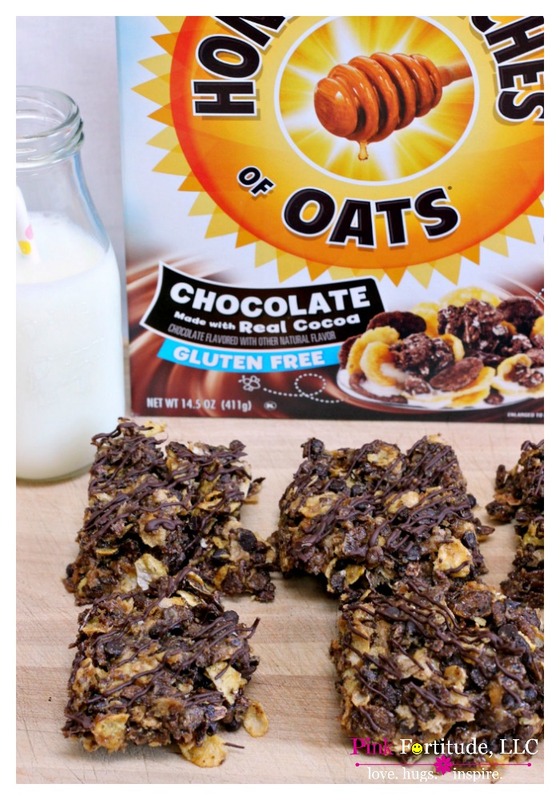 Adding Honey Bunches of Oats Chocolate cereal to these cereal bars delivers the perfect combination of crispy flakes, crunchy bunches and the yumminess of REAL cocoa. Healthy, nutritious, and chocolate. Does it get any better? And what a great evening snack… or any time for that matter! I’ve been gluten free for over a year now, and because I cook for my family, they are about 90% gluten free (they do enjoy sandwiches and pizza without me). You can read my entire story HERE. After going through breast cancer treatment and then being diagnosed with Hashimoto’s Disease, my health started to really decline. Through much trial and error, I ended up going gluten free cold turkey and have never looked back. I feel so much better, and the blood work came back to confirm that I do have sensitivities to many foods, including those containing gluten. Do I miss some of my favorite foods? Of course. But I’m really enjoying learning a new way to cook and bake and make my favorite treats allergen-friendly. My family is totally on board and loves to try my new creations. 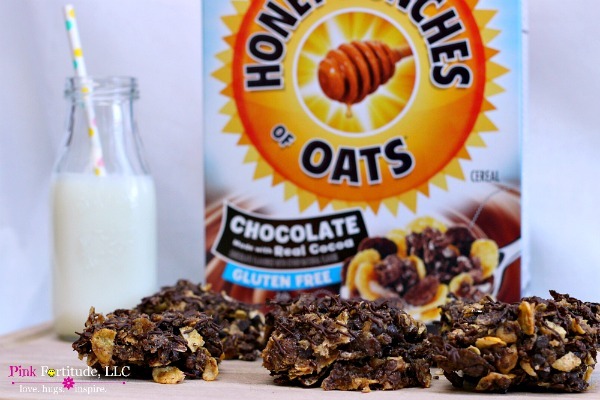 They loved these cereal bars made with gluten free Honey Bunches of Oats Chocoalte. Stepson had a friend over at the time and the kids tore into them! Cereal doesn’t always have to be for breakfast, and dessert doesn’t always have to be unhealthy. 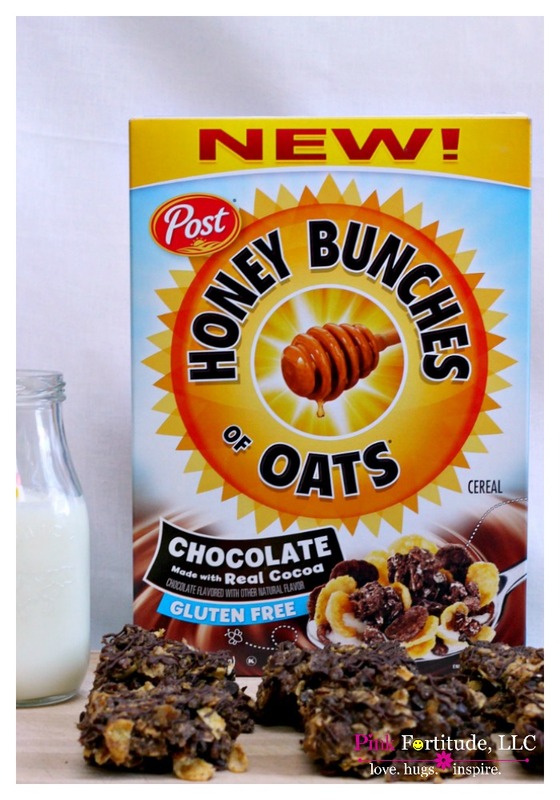 Be creative with your cereal and go beyond the bowl. Love, hugs, and in gluten free chocolate love. Oh, yummy, Holly, these sound delicious. I’m a big fan of dates so you had me right there. These look so delicious!! Thanks so much for sharing at Merry Monday! I LOVE Honey Bunches of Oats! Yummy recipe. Thanks for partying with us at Merry Monday.